Loc Rocker: Another Natural Head Rockstar! Whooooa!! Brown girls are blowin' up rock stages all over the world. I LOVE this! 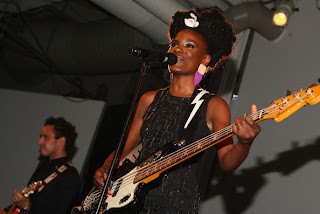 Check out Shingai from The Noisettes out of UK. She is gorgeous. And look at the fro! She almost makes me want my loose hair again. Nah I'm kidding--she's fly though. And after seeing so many brown girls rockin' out on stage, I think it's time that I invest in an electronic guitar and really be the rockstar I know I am. You can find more about this group at this post from Holistic Locs. I've been jammin' out to The Noisettes all weekend!